Seventh-year professional Lisa Ferrero moved into the lead after today’s second round of the $125,000 Santorini Riviera Nayarit Classic presented by Pepsi. The tour veteran and current LPGA Tour member carded a 5-under 68 to take a one-shot lead of 6-under 140 at El Tigre Golf & Country Club. Ferrero is trailed by rookie Amy Eneroth, who posted her own 68 to move into second place alone at 5-under 141. Ferrero’s “ho-hum day” included seven birdies and two bogeys with 27 putts, which, according to the players in her pairing, was why the Californian took the lead. El Tigre’s greens firmed up in the wind and heat, pushing the tour’s putting average to nearly 31 strokes in today’s second round. “Lisa couldn’t stop making putts,” said pairings partner Sarah Brown (70) of Lopatcong, New Jersey, who jumped into a tie for third with Canadian Izzy Beisiegel (69) of St. Hilaire, Quebec at 4-under 142. Five out of the ten mexican players at the Riviera Nayarit Classic made the cut and tough all the players struggled with the wind, Lili Álvarez (75) y Sophia Sheridan (75) se mantienen en la pelea empatadas en quinto a sólo tres golpes de la líder. 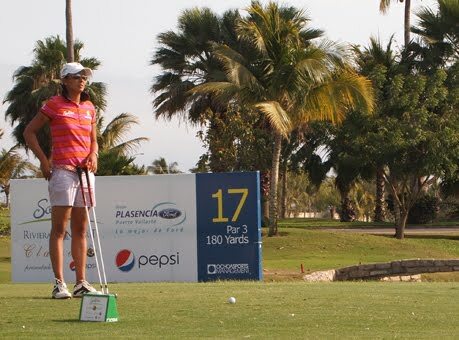 Marcela León and las amateurs Daniela Ortiz and Gaby López are other mexicans on the final round, but way far from the leader. A total of 19 players are under par with 27 players finishing at even-par 146 or better on the 6,433-yard, par-73 course. Eighty players made the 36-hole cut at 151 (+5). Sunday’s final round will begin at 8:30 a.m., off the first and tenth tees. The leaders will tee off at 10:18 a.m.
For scores and more information, visit lpgafuturestour.com. Pamela Ontiveros, a second-year professional on the LPGA Futures Tour, says she is not just playing for herself this season. The native of Mexico is now also working with a charity in her home country that benefits children. Ontiveros is now affiliated with a charitable effort called Jugador por una Causa (Player for a Cause). The program provides medical exams and treatment for children through Hogar de la Misericordia (House of Mercy), based in Sanitas, a county in Monterrey, Mexico. LPGA Futures Tour players competing this week at the Santorini Riviera Nayarit Classic have learned that the real teeth at El Tigre Golf & Country Club is the wind. And just about every afternoon, El Tigre’s bite is felt when the wind kicks up, the parasails appear on the horizon and the flagsticks bend in the stiff breeze. The par-73 El Tigre course measures 6,433 yards, and while the wind definitely demands careful attention to club selection, the tract is a long hitter’s dream. It features six par-5 holes and a whole lot of chances to make a quick climb up the leaderboard. At least two of the tour’s bombers capitalized on their advantage today when each scored two eagles during the second round. Ryann O’Toole of San Clemente, California, carded eagle-3s on the par-five 10th hole (490 yards) and the par-five 14th hole (458 yards). The 2010 two-time winner used a 5-wood from 215 yards on the 10th hole and drained a 20-foot eagle. On the 14th hole, she used a 6-iron from 175 yards and rolled in a 45-foot putt for her second eagle of the round. “It’s been a while since I’ve had two eagles in one round,” said O’Toole, who shot up the leaderboard from a tie for 20th into a tie for 10th. “The last time I did that was on two par-4s playing with friends back in high school.